Description: Made from black neoprene material. The most compact way to carry wine. 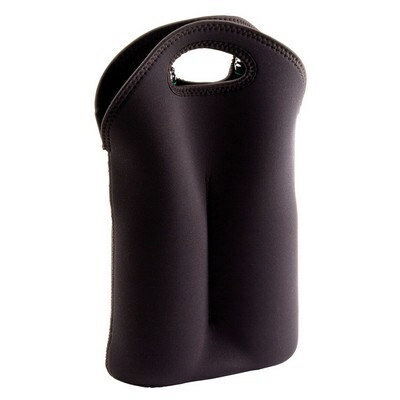 Features: Perfect fit for 2 bottles of wine Packaging: Polybag Colour: Black. Material: neoprene Product Size: 255mm(w) x 370mm(h) x 10mm ? Freight details : 50 per carton, 14kgs, 29 x 40 x 55cms; Decoration Type(s): Colour Print / Full Colour Print Decoration Area: Screen - Under Handle: 160mm(w) x 50mm(h) or Either side of Stitching: 70mm(w) x 150mm(h). Price includes : 1 Colour 1 Position Print. Setup is included.